When you suffer from tremors, arthritis, or Parkinson's Disease, it can be a challenge to enjoy a simple meal. That's why we created a smoother, more effective solution for helping those with adaptive needs. These adaptive utensils are designed to provide help to those who need a little support when it's time to enjoy a meal. Our wide, textured grip design makes it easier for someone to grasp and hold onto. Give back the much-needed confidence with these adaptive utensils that are designed specifically for adaptive needs. 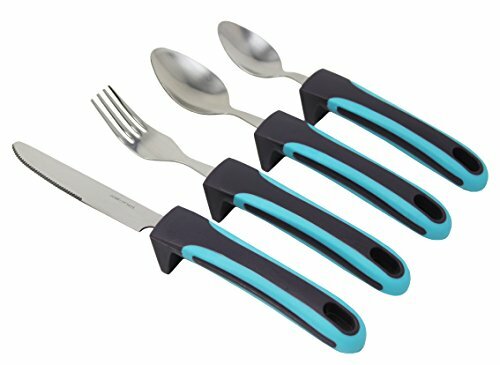 Product Details: Adaptive Utensils (4-Piece Set) Weighted, Non-Slip, Food-Grade Safe Silicone Handles with a Stainless Steel. Great for seniors, and anyone who needs a bit more support at the table. Prevents shaky hands from affecting the ability to eat independently, making mealtime easier for those with limited grip, weak hands and weak wrists, limited mobility, and trouble with functional movement. Non-Slip, Wide Grip: Each of our weighted adaptive utensils features a wider ribbed handle with raised, textured grips to improve control and dexterity. 4-Piece Set: Every order comes with four eating utensils, including a fork, knife, dinner spoon and a soup spoon. A very helpful set of built up utensils that cover a wide range of meals. Built With Durability: Along with a food-grade safe silicone handle, each utensil is made with high quality stainless steel that is dishwasher safe. 100% SATISFACTION GUARANTEED! - We are so confident about the quality of our products, we will refund you purchase if you are not satisfied.